I felt like I was in Tajikistan not China. 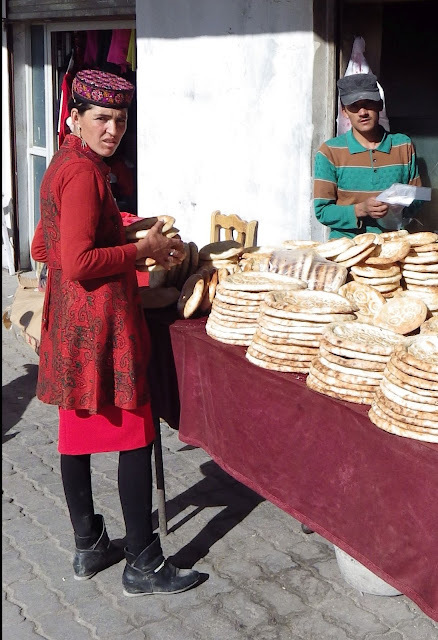 The clothes, the food, the way people dressed, all were just so Tajik. Yet I was in Tashgurkan, the first Chinese town on the Karakoram Highway which I had been travelling on since Islamabad. The border to Tajikistan is less then 10 km from Tashgurkan, and is closed to tourists. The local women wore red embroidered dresses and hats with gold braiding and a scarf attached. Striking and impossible not to stare at. This was the traditional clothing of Tajikistan, but rarely worn there nowadays except on special occasions. Here it remained daily attire, preserved by Mao’s isolationist policies and the closure of the borders seventy years ago. The other local fashion peculiarity, of women growing a monobrow, added to the strangeness of the place. If Oasis reform and need new band members to play alongside the similarly eye-browed Gallagher brothers, they should come to Tashkurgan. I had planned to head to Kashgar almost immediately, but as seemed to be becoming the norm in this remote part of China, the final leg of the Karakoram Highway was closed. Not for any holidays this time, but for road works as a massive new highway was being built. I was stuck yet again. Although this town did at least offer a little more variety, and entertainment, than was the case in Sost over the border. Tashkurgan has one site, and one site only, worth visiting. The Stone Fort. Built 1,400 years ago and, despite being damaged in battles with the Persians and Mongols, and then ravaged for building materials during the Cultural Revolution, still stands dominating the surrounding plains. Marco Polo is alleged to have stayed there during his travels. The town being small, it was an easy ten-minute walk from the centre to the small unattended ticket booth. Recognisable from the film ‘The Kite Runner’ where it stood in for an Afghanistan fort, from the outside it was spectacular, the distant snow topped Pamir mountains providing a great backdrop. Inside it was suffering the fate of all historical buildings in China, it was being rebuilt, with little thought to authenticity. Howling packs of dogs circled as the sun began to set, and I sensibly decided that my planned sunset photograph was not worth the risk of dog attack or rabies, and I headed back to the hotel before my journey on to Kashgar. The Tajikistan influence diminished as I headed east. Kyrgyz stone houses replaced the yurts that populated the grasslands around Tashkurgan. The nomadic people cut off from their wanderings around their homeland over the nearby Tian Shan mountain ranges by the mistrust of Mao and Khrushchev. The men’s distinctive white hat, embroidered with black etched flowers, means their ethnicity was easily recognisable on the frequent motorbikes that pass us. The flat plains are home to their herds of yak and camel, which can be seen by, and all too often on, the road. I stopped at Bunlunkou Lake, 100 km from Kashgar. The vista in this remote part of Xianjiang province was stunning. Few cars even stopped at the lake, which was one of the most beautiful sites I have seen all over China. I explored the surrounding area, gazing into the water at the mirrored image of the sand dunes topped in front of the distant snow topped mountains. Chinese army checkpoints became more common as we approached the outskirts of Kashgar, one of two major cities in Xinjiang province, the other being Urumqi 1,500 Km away. Cameras, ostensibly to monitor speed, are mounted over the road every 5 km, catching the registration and movement of all cars. Inside Kashgar itself, particularly in the old town where most Uighur’s live, cameras are mounted on almost every lamp post, their brightly painted white colour particularly incongruous against the mud brick houses, while airline style metal detectors are used outside of shopping centres, mosques, and even on pedestrian underpasses. When I had planned this journey it seemed fitting that it should end in the ancient Silk Road city of Kashgar. The very word conjures up images of spices, markets and ancient architecture. The reality did not match the vision in my mind, unlike so much of the Karakoram Highway that I had travelled, where the remoteness and only small local populations had allowed buildings and landscapes to remain untouched for centuries. Kashgar resembled any other modern Chinese city. Glass plated office buildings, massive congested roads, and ugly 1980’s apartment blocks. The old town had been mostly destroyed, what was left was rebuilt to create a theme park Kashgar with red Chinese flags flying from each building. Walking away from the ‘old town’ I found an original small hill of dwellings fifteen minutes away, already earmarked for destruction with signs saying ‘No Entry’ and warning of danger and collapsing buildings. Glimpses of traditional courtyards could be caught through slightly ajar thick wooden doors. An old mosque with beautiful Islamic writing on blue tiles was still welcoming worshippers, and charcoal burners on the street were slowly roasting lamb shashlik for 2 RMB (US$ 0.35) each. It was clear that this part of Kashgar had an expiry date that was approaching rapidly, but I was glad I had experienced a small part of what the city used to be in the times of the Silk Road, and where the spectacular and unforgettable Karakoram Highway finally came to an end.